Hasbro Gaming has been bringing fun to families across the globe for generations. 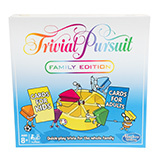 They've inspired families to solve murder mysteries with Cluedo, test their knowledge with Trivial Pursuit and tangle themselves in knots with Twister. And now, together with Heart, they're offering even more fun to one lucky winner who'll be able to bring the family together and go away for an exhilarating adventure weekend Snowdonia, Wales. Hasbro Gaming is bringing the next generation of new and exciting games to kids and parents alike, so grab your family and friends and make some memories together with the latest from Hasbro Gaming. One of the newcomers is Pie Face Cannon, where players take aim and "pie" their opponent with a cannon full of whipped cream! And then there's Chow Crown – a game with a tasty twist! Players hilariously try to bite off the food without using their hands and aim to eat them all before the music stops. Other new games include Speech Breaker – put on the game headset, talk into the microphone, and get your teammates to guess who/what/where without saying any of the words on the cards. What's the catch? The microphone jams your speech with a built in delay! 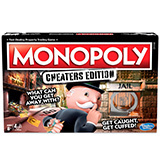 – and Monopoly Cheaters, we all know someone who loves to cheat during a game of Monopoly, but now it's part of the fun! Follow, bend or break the rules to win! Whether it's a classic game or a new one, Hasbro Gaming offers the best in family fun. The time to play is now! Get moving with the Twister game! It's the on-the-floor party game where the spinner calls the shots and you make the moves. 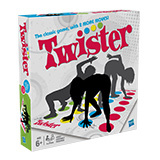 The classic Twister spots and laugh-out-loud action will have you and your friends tangled up in fun in no time. Quick-play trivia for the whole family. Features cards for kids and cards for adults. Want To Win A Weekend Away For The Family? We're offering return travel for two adults and two children to picturesque Snowdonia, Wales, with overnight accommodation, breakfast, and tickets for Bounce Below and Treetop Nets at Zip World Forest. We're also giving away a games bundle courtesy of Hasbro Gaming. For a chance to win this fantastic prize, simply take part in our Connect Four game below before before 11:00 on Friday 9th November 2018. T&Cs apply.